Get the new book by "I" of the Consumer author, Zach Heller. 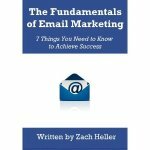 This book was created to serve as a handbook for anyone new to email marketing, or marketing professionals who are looking to improve the efficiency of their email marketing programs. Email is an important part of today's marketing atmosphere, and this book is designed to help you get the most out of any email marketing campaigns.